It’s the perfect space saver that can tuck into a purse or pocket. Dimensions: Open: 13" x 15" x 6"; Stashed: 4.5" x 3" x 2"
This product was small enough to fit in a purse and cute as can be. Just love my LOVE tote! Glad I made this purchase. Get plenty of compliments and use it almost every day. Love this bag! Stores nicely in my purse and carries so much! We all love reusable bags, but where the heck are they when you need them? The Stash It bag has a self- contained pouch and clip, making it unforgettable when you hook it onto your keys, belt loop or purse. 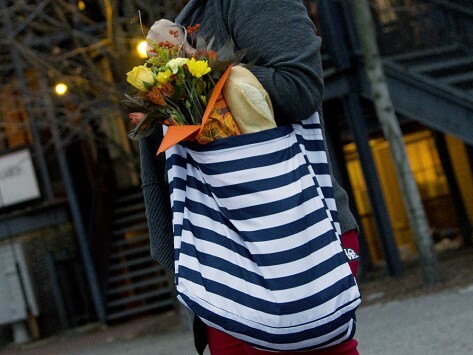 The tote, from the LOVE Reusable Bags line, was designed for the on-the-go, eco friendly shopper. This roomy bag is a lightweight but performs like a heavyweight, able to carry up to 35 pounds. The founders of Love Reusable Bags, Gary Crane and Joe Rogers, a former apparel exec, are fashion forward designers whose prints and patterns are trendy and fun. They fabricate using machine washable 100% polyester, that's durable but soft to the touch. The no slip, felt strap lays flat and secure on your shoulder. Stash it close by and never forget your reusable bags again.